Personalized BBQ Sets in Bulk. Promotional, Inexpensive. Budget Prices in the USA and Canada. 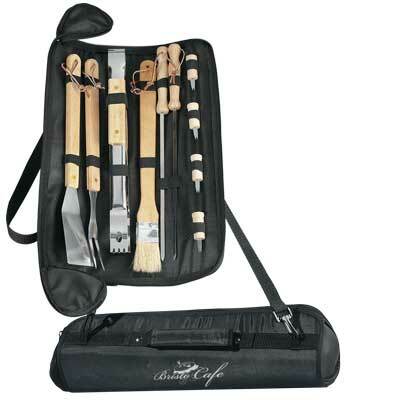 Bulk Barbeque Set in Personalized Carrying Bag. Budget Prices in USA and Canada for wholesale promotional BBQ Sets. American clients pay no taxes. The unit prices below include your 1-color custom imprint on one side of the bag. You may order any quantity above the minimum. Imprint Method: Silk-Screen imprint on the bag. Packaging: 20 per carton @ 43 lbs.